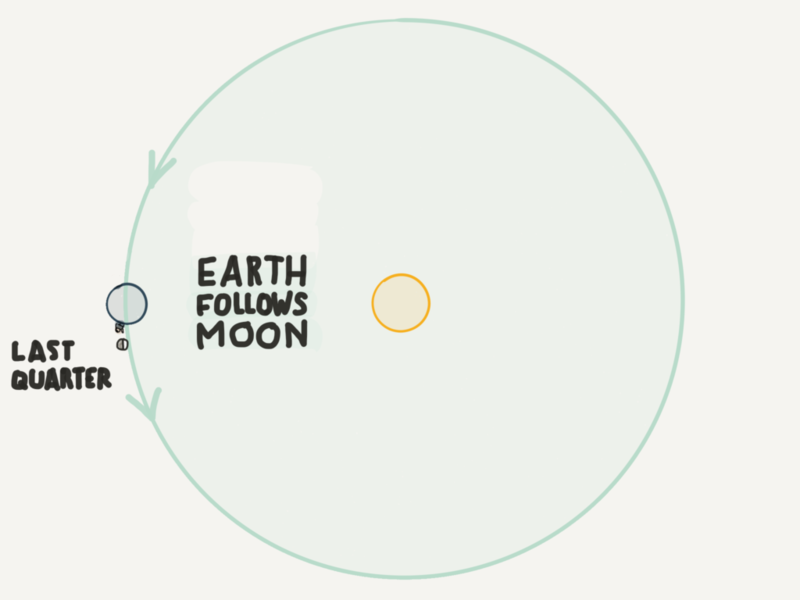 You can use the moon to “see” the Earth’s orbit in the sky and the space beyond. Most people think the full moon is the best moon phase. We get to see the whole glorious sphere lit up full on one side. The full light of the sun brightens the surface of the moon so much that the sunlight reflected off moon makes shadows at night. Other people like the New moon. Maybe it’s because it symbolizes new beginnings, or because the moon is hidden in the glare of the sun like it’s not even there. 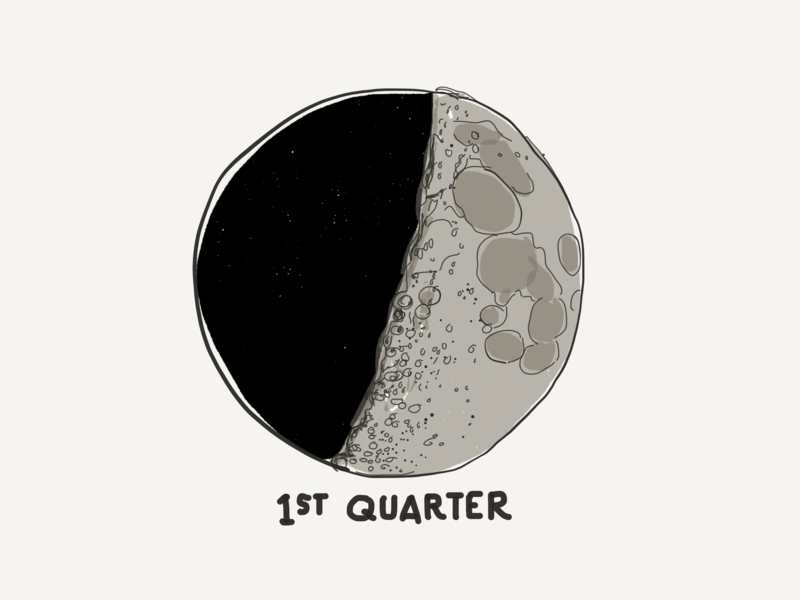 My favorites are the two half moons – the first quarter and the last quarter. I like these phases because they show us something beyond the moon. 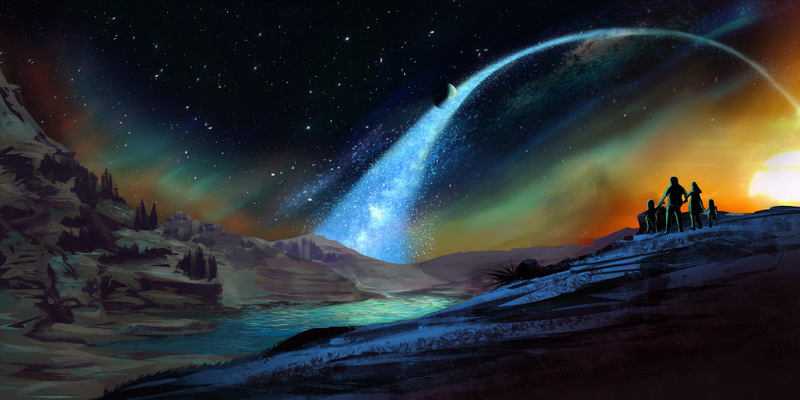 And with a little bit of imagination they allow us to see into the depths of space. The half moons are like helpful guideposts that show you the orbit of the earth. Fact 1) the earth orbits the sun. Fact 2) if you look up at the sky you are actually looking into space. This is easier to imagine at night when the stars are bright enough to reveal the depth of the sky. During the day we have blue. Fact 3) Every 29.5 days (approximately) the moon orbits the earth. 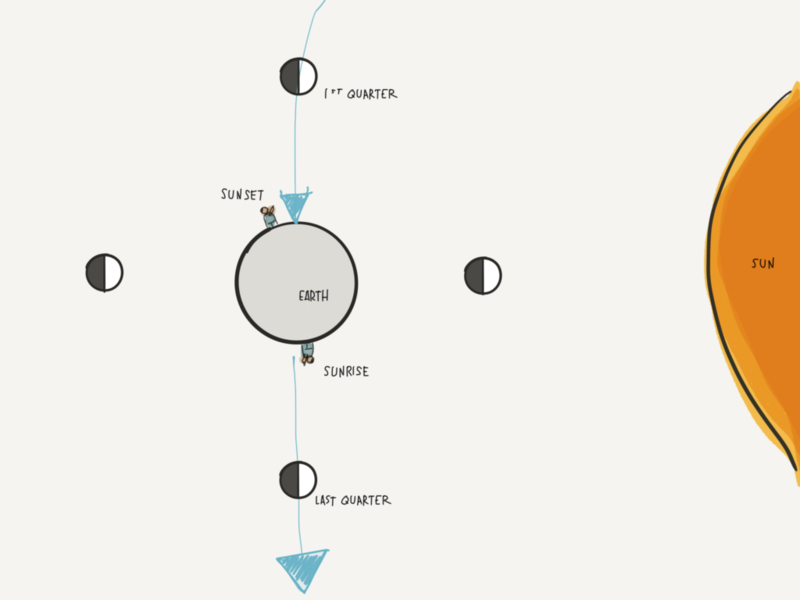 During its orbit, the moon crosses the Earth’s orbital path twice! So when you see the moon hanging up there my hope is that you can understand that the moon is up in space being tugged along by the earth. I like to imagine that the moon is crossing a stream of sparkly, dust particles like a trail in space tracing out the earth’s orbit. The first quarter moon is ideal for viewing this tugging along. The moon is trailing us in orbit. So, when you look up at the moon in this phase, you are looking at where the earth just was in space! The moon follows the earth. 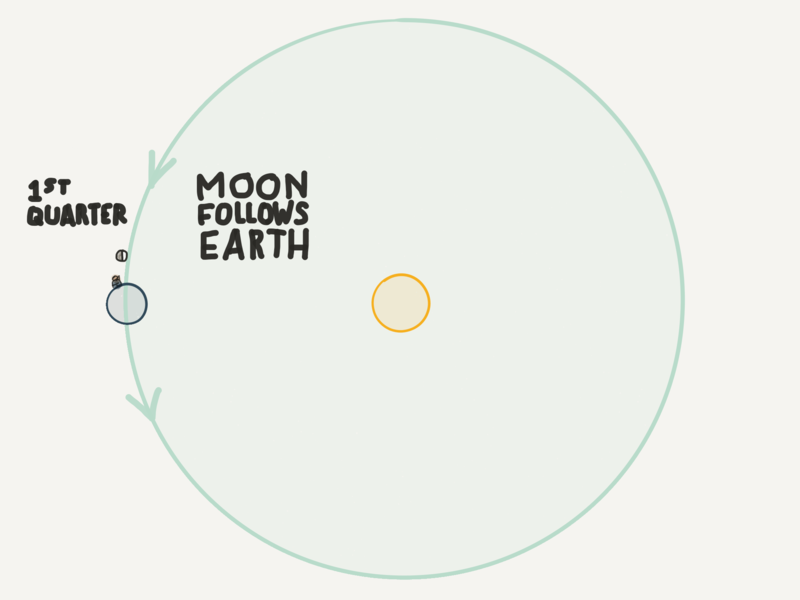 In the last quarter phase of the moon, the Earth follows the moon along the earth’s orbital path. It’s like the earth chases the moon during this phase. So, when you look up at the moon in this phase, you are looking at the direction the Earth is heading. If you could actually see the earth’s orbit in the sky, it would mark day and night. It would look like a tall rocket ship cloud trail after launch always directly overhead at sunset and dawn. A family views the visible orbit path of the earth. The next time you catch a glimpse of the half moon hanging in the morning or evening sky, try to imagine the moon leading or following us here on earth as we orbit the sun together. Questions? Comments? Type to me below!